The National Board of the Society of Collegiate Journalists, a national honorary society for collegiate mass communication, announces its 2015 individual winners: the Arthur H. Barlow Award for Student Journalist of the Year, Edward E. McDonald Chapter of the Year Award, Outstanding New Adviser Award and the New Chapter of the Year Award. Each award recognizes the accomplishments of students, advisers or chapters that have shown exceptional work in journalism and philanthropy. Plaques were presented to all winners at their institutions. Ms. Fleischel also received a $500 stipend. The chapter is active with two events annually, including News Engagement Day. SCJ members handed out local newspapers free-of-charge to students and encouraged them to engage with campus and local media through social media. 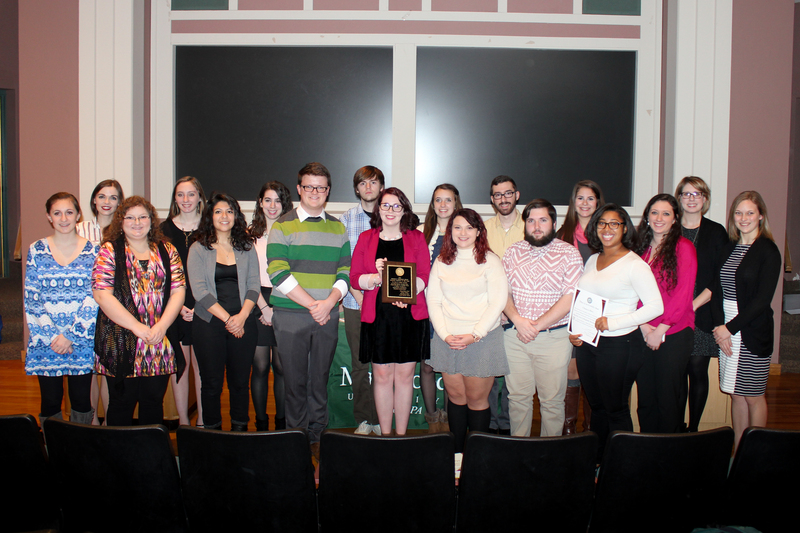 The Marywood University Chapter accepted the Edward E. McDonald Award Chapter of the Year Award at their annual induction ceremony held on November 13, 2015. Photo courtesy Marywood University. These awards recognizes a newly established or reactivated (no longer than six years and no shorter than two years) chapter that shows enthusiasm and is a welcome new member of the SCJ family and a mentor who has advised a chapter (new or existing) for a period of no longer than six years and no shorter than two years. The adviser actively assists a chapter and its members participate in SCJ activities such as inductions, contests and philanthropy. Tilton makes sure to help his students feel comfortable telling the hard stories they feel are important to their local community, as well as coordinate key speakers discuss the industry with his members. 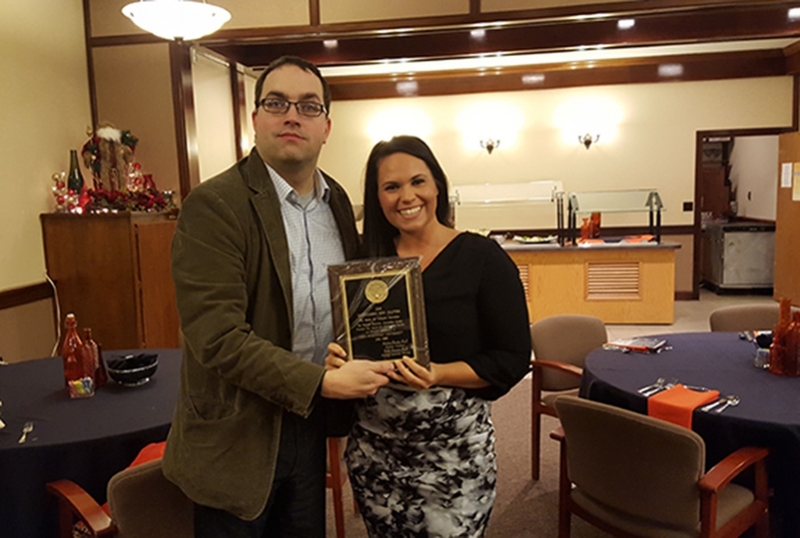 ONU Chapter adviser Shane Tilton and Chapter president Ashlee McDonnell accept the Outstanding New Chapter Award. Photo courtesy Ohio Northern University. Don’t forget! Please send along photos of induction ceremonies, SCJ-sponsored events, and the like so we can share your good news with the rest of our SCJ family. Email pictures and information to scjnationaloffice@gmail.com.